LowCVP News - LowCVP Annual Conference 2019 - save the date: July 8! LowCVP Annual Conference 2019 - save the date: July 8! The LowCVP's 2019 Annual Conference will take place in Westminster, London on Monday, July 8th. The event will focus on the fuels agenda, acknowledging the momentum behind moves to 'electrify everything', while analysing which other fuel types can support the drive to cut emissions in the short, medium and long-term and what policy interventions are required to support them. 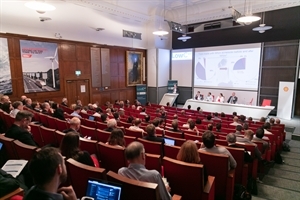 The LowCVP Conference will form part of a two-day fuels-focused event (8-9 July), held in collaboration with the Institution of Mechanical Engineers (IMechE) and in association with the Renewable Energy Association (REA). The UK's vehicle fleet is still over 99.5% combustion engine-powered so it's vital to tackle these in order to reduce emissions as much as possible while they are still in operation on UK roads. The two events focusing on future fuels will be co-located at One Birdcage Walk. The Monday will focus on fuels policy (the LowCVP Annual Conference) and the second day (Tuesday), run by IMechE, (Low Carbon Transport: Engineering the Fuels of the Future), will focus on fuels practice, technology and emissions testing. Discounts will be available for delegates who book for both days. Fees for the LowCVP Conference are significantly lower for representatives of LowCVP member organisations. IMechE and REA members will also receive discounts. The 2019 LowCVP Conference will be held in association with the Renewable Energy Association who will be collaborating in a parallel discussion on the role of development fuels during the afternoon. A post-conference drinks reception will be held in the grand Victorian library at One Birdcage Walk, bringing together delegates and participants from both events as well as invited MPs, Lords and other VIPs. The booking website will be open soon. You can register early interest to receive updates about the event's by emailing the LowCVP Secretariat. LowCVP issues a monthly e-Newsletter; a digest of the latest news, policy and technical developments in low carbon road transport. It will also keep you up to date with the latest LowCVP activities and initiatives. Electric Vehicle Energy Taskforce (EVET) news only?